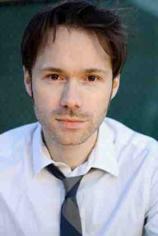 Michael Sinterniklaas (born August 13, 1972 in France) is the American voice actor for Leonardo in the 2003 animated series, Fast Forward, Back to the Sewer,Turtles Forever and various video games. He has provided voices for a number of English language versions of Japanese anime films and television series, as well as video games. Sinterniklaas is the founder of NYAV Post, A Bi-coastal studio located in New York City and Los Angeles, which dubbed more than over 350 different anime titles and recorded several original prelay works. He was born in France, and moved to the United States when he was 10 years old. Sinterniklaas graduated from High School of the Performing Arts in New York City, and attended college in North Carolina where he did work at both Southwynde and Coastal Carolina Studios. Recently, he has started doing voice work and directing work in the west coast more frequently, and has started directing bi-coastal dubs of anime and prelay productions. He also replaced David Moo as Xellos in the English dub of Slayers Revolution and Evolution-R. As of 2010, Michael passes Stephen Stotch’s role to Kirk Thornton.